Welcome to Escalation! Escalation is a simulation of the Vietnam War where you can make decisions as President Johnson. The decisions you make at the beginning determine what decisions you will be confronted with later and what outcome you get. No two simulations are the same! Here is a sample screen from the simulation. At the top (A) you will see the current date and what type of information is on this screen. On the right (B) is a record of troops, casualties, wounded, and your popularity as president. In the center (C) you have a description of what is happening, what your advisers are saying, and what you need to decide. Below that (D) is where you make decisions about sending in troops, negotiating, bombing, or other policies. At the bottom (E) you can save and exit at any time by clicking "Menu." On many screens you can click the "document" button to view actual documents from the time of the Vietnam War. There are 7 types of screens: South Vietnam, military, bombing, negotiations, US politics, overall policy, and decisions. The color of the picture at the top tells you which type of screen it is. Below are some sample photos. South Vietnam: You receive frequent information reports on the political and social situation in South Vietnam. One of the big issues is land reform and support of the peasants. Military: You'll be notified of battles that have taken place, your casualties, and estimates of enemy casualties. The battles are historically accurate. You also get advice about whether to send more troops. Bombing: You make decisions about where, when, and how to bomb. You also get a lot of advice on the subject, but your advisers rarely agree with each other. Negotiations: You get advice about whether to negotiate with the North Vietnamese, the Vietcong, or not at all. You can send messages and you must react to messages from the enemy. U.S. Politics: Decide what to tell the American public about what is happening in Vietnam. Choose what stances to take in political campaigns and what economic policies to adopt. Overall Policy: This is where you decide what your general policy will be in Vietnam. You must choose your policy before you can decide what actions you will take. 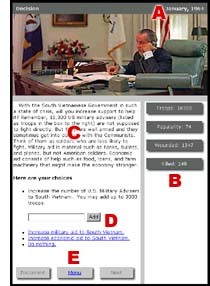 Decision Making: On these screens you actually make the decisions about troops and policies after getting information and advice from many sources.